Bruschetta is a traditional Italian dish of sliced bread toasted on the grill and topped with different fresh ingredients: tomato, bell peppers, olives, mozzarella, prosciutto, mushrooms, papperoni, eggplant, zucchini, and different herbs or salad leaves. 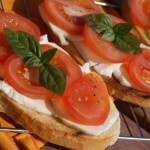 This bruschetta, tomatoes with mozzarella, is the most common. It is better to use high-quality olive oil. You can cook outdoors on the grill or at home on a dry frying pan. Cut tomatoes and mozzarella into 12 slices. Fry the bread slices on a grill and then rub this side with garlic cloves, then sprinkle the top with olive oil on both sides. 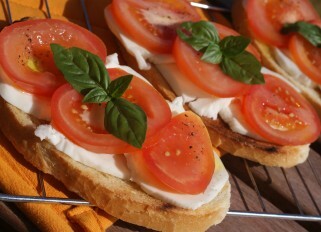 Carefully lay Bruschetta on a grill, just fry under the lid, about 2-3 minutes. Garnish with basil leaves and serve immediately.